A German version of the very famous and significant Bellin Map of Australia. 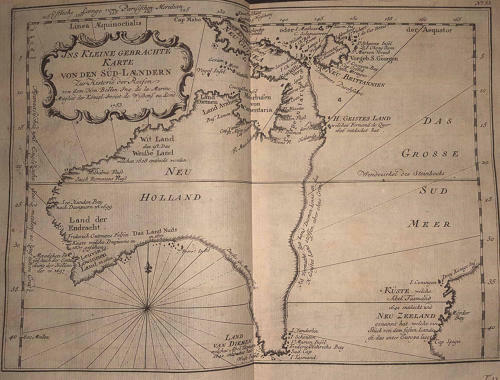 One of the earliest obtainable separate maps of Australia. Tasmania (Land Van Diemen) and Papua New Guinea (Neu Guinea) are still joined to the main island. This is one of the few 18th century maps to focus on the Australian continent prior to Cook's famous first voyage from 1768-1771. Very rare German version, published in "Allgemeine Historie der Reisen", Leipzig, 1754.